A residential barn designed by Red Architecture and built using recycled bricks taken from the rubble of the Christchurch earthquake has been awarded the 2014 ADNZ Supreme National Design Award. 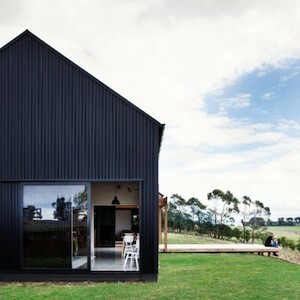 Located in Whatawhata, New Zealand, the ‘Modern Barn Form’ features two barn-like structures clad in black vertical run steel and the reused bricks. One barn houses the main living and sleeping areas for the private residence while the second form is detached from the main dwelling and holds a garage. A cedar-clad recess cut out of the centre of the house provides a covered outdoor area to the home. The project was lead by Red Architecture’s designer Tane Cox, who was commended by the Award judges for his fresh interpretation of a traditional form. The Modern Barn Form was selected from 76 entries across categories including commercial design, residential new homes, alterations and multi-unit dwellings. In addition to the Supreme Award winner, eight designs from across New Zealand were presented Resene Architectural Design Awards.